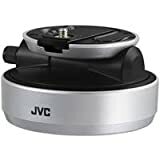 The JVC CU-PC1 Pan Cradle for All Wi-Fi Equipped 2013 Everio Camcorders allows you to control your Wi-Fi equipped 2013 Everio camcorder remotely with your iOS or Android smartphone or tablet. It features dual speed 180deg. motorized panning and 40deg. manual tilting. The CU-PC1 is tripod mountable and can be powered by either the included AC adapter or two AA (LR6/HR6) batteries (sold separately).